Sorry, But the guns have been sold but we still have the arena. Thinking about getting into Laser Tag? 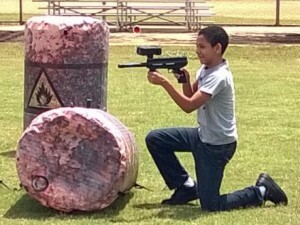 This laser tag equipment is all you need to get started. This is a great deal on a barely used 12 gun indoor/outdoor laser tag system. It even comes with Inflatable Bunkers. These bunkers are easy to inflate and set up. They can be used either indoor or out door with weighted bases they are able to stand up to lite wind. Custom made by TippMann converted from paintball guns. Units are in perfect order, and have only been turned on twice. Along with the guns comes wireless router allowing you to connect guns to computer with free software. Also comes with 2 IR targets which when connected can be used as respawns or point scoring or base destroying. You do not need to worry about support for these guns and they can be easily upgraded to Paint Ball or Bazooka Ball guns. Good day. We have a full field setup of tactical inflatable bunkers for sale, and comes with industrial air compressor to fill them. Selling at huge discount of total worth. have only been used twice. if interested, please let us know. I would like to have the price for this. Do I need any other equipment to get this started? Donna if you follow the link it will take you to the page that gives you more info about this.